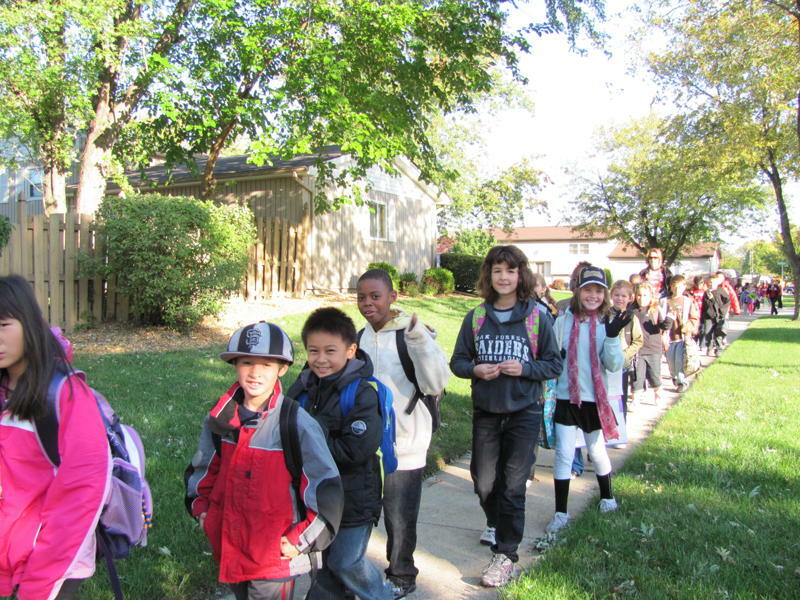 School districts across Illinois are working to meet a new requirement to teach biking and walking safety while celebrating national Walk to School Day on Wednesday, October 10. Illinois crash data shows nearly five children are hit by people driving every day in Illinois while walking or biking within one block of a school. In August, Governor Rauner signed the Bike Walk Education in Schools Act (HB4799) into law. The legislation amends the school code so that every K-8 public school in Illinois is required to provide instruction, study and discussion of effective methods for the prevention and avoidance of traffic injuries related to walking and bicycling. Teaching walking and biking safely saves lives while helping kids get more physical activity, reducing the risk of obesity and promoting good overall health. Active Trans worked with legislators to draft and pass the Bike Walk Education in Schools Act this year. Walk to School Day provides a great opportunity for school districts across the state to get to work meeting the requirements of the new law. There are many free resources available to help districts meet this new requirement. Active Trans worked with the Illinois Association of School Boards to compile a resource list and share it directly with school districts. Options range from online quizzes and videos to guide books with a checklist of teaching points and lesson plans. More ambitious programs include on-bike education at schools. Active Trans is working with advocates across the region to share these resources with their local school board and encourage them to get to work on meeting the new requirement. Advocates and districts who are interested in learning more can contact education@activetrans.org. While Active Trans sees this new law as an important step forward in making Illinois a safer place for kids to bike and walk, this is just one of several changes needed to improve biking and walking safety. We also need safer driving habits for motorists and streets that are designed for safer biking and walking.